PHILADELPHIA (WPVI) -- The Ben Franklin Parkway in Philadelphia is now completely closed ahead of the 2017 NFL Draft. Along with that closure comes a number of parking changes and increased SEPTA service to help you get around. 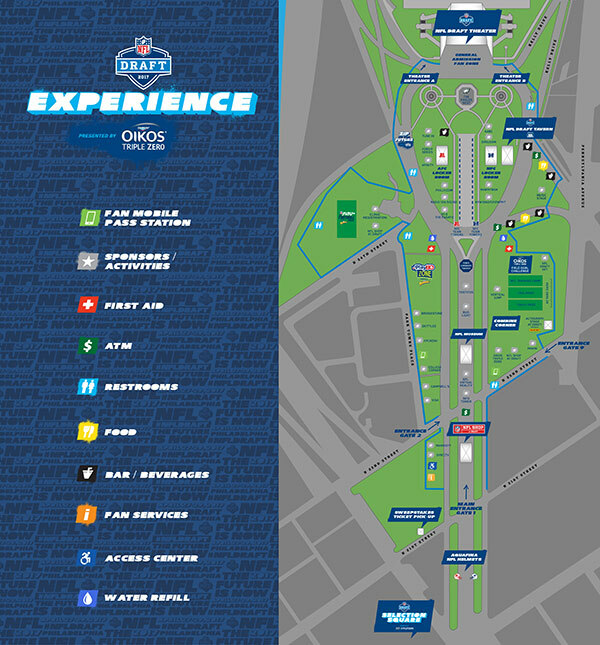 The three-day NFL Draft festival will take place Thursday, April 27th through Saturday, April 29th on the Ben Franklin Parkway, Eakins Oval and the steps of the Philadelphia Museum of Art. -Spring Garden Street westbound will close at Pennsylvania Avenue. -The westbound center roadway of Benjamin Franklin Parkway will maintain two lanes from 20th Street to Eakins Oval. The left lane of Benjamin Franklin Parkway will be closed from East Eakins Oval to Spring Garden St. and continue to southbound Kelly Drive, where it will open up to three travel lanes. -The right two lanes of Eakins Oval in front of the Art Museum steps will be closed for the building of the theatre. -Southbound Kelly Drive will have a lane drop between 25th St. and Benjamin Franklin Parkway. -Inner lanes (inbound and outbound) of Benjamin Franklin Parkway closed from Eakins Oval to 20th Street. -Benjamin Franklin Parkway will be closed from 20th Street to the Art Museum. -Martin Luther King Drive will remain open to 24th Street. -Eastbound Spring Garden Street will remain open from 31st Street to 24th Street. -Kelly Drive will be closed at Fairmount Avenue with traffic detoured onto Fairmount Avenue and Pennsylvania Avenue. Phase 2 of NFL Draft detours begins Wednesday. Sarah Bloomquist reports during Action News at 5 p.m. on April 18. Starting at 7:00pm on Monday, April 24th, due to the closure of the outer lanes on the Benjamin Franklin Parkway, traffic headed inbound (to Center City) from Spring Garden Street Bridge or Martin Luther King Drive must exit Eakins Oval on the 24th Street ramp. Traffic headed inbound on Kelly Drive must exit Kelly Drive at Fairmount Avenue. Those wishing to access the rear of the Philadelphia Museum of Art on the north side must exit onto Fairmount Avenue, turn right on Pennsylvania Avenue and proceed SB on 25th Street onto Anne d'Harnoncourt Drive. Total Parkway closures take effect. Dann Cuellar reports during Action News at 11 p.m. on April 24. During venue construction, a number of bicycle lanes along the Benjamin Franklin Parkway, Eakins Oval and in front of the Philadelphia Museum of Art will be detoured. Appropriate signage will be prominently displayed, and cyclists are advised to utilize marked detours. During venue construction, a number of sidewalks and pathways along the Benjamin Franklin Parkway, Eakins Oval and in front of the Philadelphia Museum of Art will be detoured. Appropriate signage will be prominently displayed, and pedestrians are advised to utilize marked detours and avoid walking in the street. The primary north-south pedestrian detours will be 22nd Street and Anne d'Harnoncourt Drive. SEPTA is a convenient, affordable way for fans to get to and from the event grounds. The PHLCVB has secured FREE parking at the sports stadium complex for NFL Draft Experience attendees. From the sports stadium complex, event-goers should utilize the Broad Street Subway at AT&T Station, located at Broad Street and Pattison Avenue. Fares can be purchased onsite, and fans are encouraged to purchase their return fare prior to departing AT&T Station. the draft on April 27 and 28. Local train service will operate on a regular weekend schedule April 29. All current construction projects will be postponed April 27-29. Regular train service will operate on SEPTA's Regional Rail Lines during the Draft Experience and Penn Relays. Off-peak trains will be travelling with additional cars to accommodate increased ridership. Regional Rail schedules are available online at www.septa.org. SEPTA Trolley Routes 10, 11, 13, 15, 34 and 36 offer convenient service through Center City, with 19th and 22nd Street Stations providing easy walking access to Benjamin Franklin Parkway and 33rd, 36th and 37th Street Stations serving University City. Extra trolleys on Routes 10, 11, 13, 34 and 36 will operate on April 27 and 28 to accommodate the draft. Trolley Route 15 connects with the Broad Street Line at Broad Street and Girard Avenue and the Market Frankford Line at Front Street and Girard Avenue. Due to Draft event-related road closures, SEPTA Bus Routes 7, 27, 32, 38, 43 and 48 will be detoured through the Benjamin Franklin Parkway area for event set-up, during the three-day Draft Experience and breakdown following the festivities. Some detours on Routes 27, 38 and 43 begin on Monday, April 10. All detours and their effective dates will be posted in the System Status section of www.septa.org. SEPTA's Norristown High Speed Line can transport riders from Delaware and Montgomery Counties to 69th Street Transportation Center, where they can transfer to the Market-Frankford Line headed toward Center City and University City Philadelphia. Street Line at AT&T Station at Broad Street and Pattison Avenue. Free parking (approximately 300 spots) will also be available at the Festival Pier lot at Columbus Boulevard and Spring Garden Street beginning on Wednesday, April 26. SEPTA's Route 43 bus and the Market-Frankford Line's Spring Garden Station can be accessed from that lot, which has approximately 300 spaces available. - The parking garage at Norristown Transportation Center-located adjacent to the Manayunk/Norristown Regional Rail Line and the Norristown High Speed Line-has approximately 270 open spaces. - The SEPTA lot at Cornwells Heights Station on the Trenton Regional Rail Line, has approximately 600 open spaces. - The garage at Frankford Transportation Center has approximately 115 open spaces. The new Lansdale Station parking garage at Lansdale Regional Rail Station will open later this month. The garage has a total of 680 spots, which will be free of charge until June 18. Parking is also free at all SEPTA-owned Regional Rail lots on weekends. Parking lot location information is available online at www.septa.org/parking. SEPTA urges those using its trains, subways, buses and trolleys to purchase their tickets and passes in advance. SEPTA Key electronic fare card kiosks are now open at all Broad Street Line and Market-Frankford Line stations and SEPTA sales offices. SEPTA Key cards are accepted on the Broad Street, Market-Frankford and Norristown High Speed Lines, and on all SEPTA buses and trolleys. Additionally, customers taking SEPTA's Airport Regional Rail Line will be able to purchase "Quick Trip" tickets at fare kiosks located at each terminal stop for travel between Philadelphia International Airport and anywhere on the SEPTA rail system. For information on SEPTA Key, visit www.septa.key.org. Passengers can also purchase one-day $8 Convenience Passes, $12 Individual and $29 Family Independence Passes. Details on all SEPTA fare options are available at www.septa.org/fares/. SEPTA service changes/alerts can be found at www.septa.org. SEPTA Customer Service can be reached at 215-580-7800 and directly on Twitter @septa_social. For more information on SEPTA and NJ Transit routes and schedules during the NFL Draft Experience, visit www.septa.org or call 215-580-7800, and www.njtransit.org or call 973-275-5555. The PHLASH Downtown Loop will add service for Thursday, 4/27 for the NFL Draft Experience and will operate its April weekend schedule Friday, 4/28 - Sunday, 4/30. PHLASH runs 10 a.m. - 6 p.m. and is an easy, inexpensive way to get around. PHLASH will re-route due to street closures during the NFL Draft Experience and will communicate any detours at http://RidePhillyPHLASH.com. If driving into Center City is necessary, commercial off-street parking lots and garages conveniently are located near the Benjamin Franklin Parkway. Contact individual facilities in advance for rates and availability, or visit the Philadelphia Parking Authority's website at www.philapark.org for a list of parking options. The NFL Draft Experience is not affiliated with these parking facilities. Most of the cultural institutions on the Benjamin Franklin Parkway will maintain normal hours of operation and, in some cases, even extend schedules during the NFL Draft Experience. Visitors and residents are encouraged to visit.